The Minger Foundation has been highly active in the development of new laws to help protect student with disabilities. Some of our successful legislative accomplishments are highlighted below. Make a donation today to help support our important legislative work! With the introduction of Senate Bill 158 during the 2014 legislative session by State Senator Stan Humpries, it was a whirlwind visit back in the Capitol of Kentucky working on changing the name of the Michael Minger Act to the Michael Minger Life Safety Act. 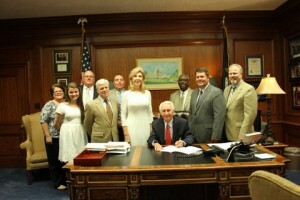 The House and Senate voted unanimously to pass the bill and it was signed into law by Governor Beshear. The provisions of the Campus Fire Safety Right-to-Know Act were signed into law in 2008. This legislation had first been introduced in 1999 following the horrific fire at Seton Hall University that claimed the lives of three freshman. It requires that all schools report make publicly available fire safety information such as the number of fires that have occurred and any deaths, injuries, and damage that has occurred. It also requires that they report this information to the U.S. Department of Education along with information on the level of fire protection in their residence halls. First introduced in 2005, this program has grown each year with more governors issuing proclamations recognizing September as National Campus Fire Safety Month. In addition, resolutions have been introduced and passed in Congress, supporting it as well. You can follow what states are issuing proclamations at Campus Firewatch. Automatic fire sprinklers are known to save lives. Unfortunately, there are so many buildings that do not have them, especially where students are living. According to Campus Firewatch, over 80% of campus-related fire fatalities occur in off-campus housing (PDF download), which is where 2/3 of the students across the nation live. This bill will provide a significant tax incentive for landlords and property owners to install sprinklers in these buildings. Learn more about this important legislation and what you can do.